I asked Dan Baker if he’s gotten feedback from the field in his 40-plus years of PA work. 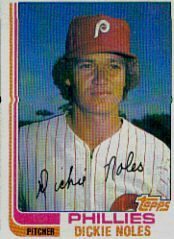 “I don’t remember which Phillie complimented me first, but when Jayson Werth returned as a Washington National, he said it wasn’t the same without me introducing him. Well deserved praise for a humble hero. Meanwhile, savor another tale of a grateful Phil appreciating Baker’s vocal talents. 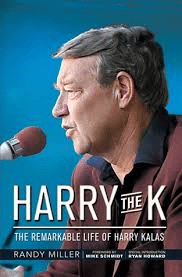 Coming Thursday: Remembering Harry Kalas. I loved hearing from baseball’s longest-tenured public address announcer. I’m grateful that Philadelphia legend Dan Baker provided some kind, insightful answers. To learn more about Philly’s PA tradition, check out the superb blog geared especially for team voices. Coming Monday: Discover two of Baker’s Phillie fans! One of the joys of this blog is finding all-star readers. These are the gamers of the hobby, those tireless collectors who do autographs their way. “I have enjoyed your posts this month. 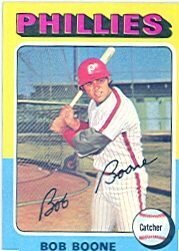 My “why won’t this guy sign for me?” is Bob Boone. 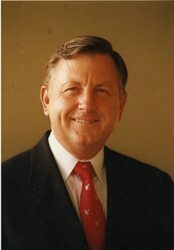 I have gotten RTS returns from him both through the Nationals and at his home address while the rest of the world seems to be racking up successes at both addresses with one or two week turnarounds. I am chalking it up to bad timing, as I sent to the Nationals in January and to his home in California in May. “I had the chance to meet Wade Boggs on Wednesday when I went to the Rays-Red Sox game. He was doing a charity signing at the Ted Williams Museum prior to the game. It was $30, well more than the $5 he charges TTM but it was worth it as the money went to the Boston Strong fund as well as a military veterans fund. Now I have a photo with Wade that I am getting made into an 8×10 to get signed! Speaking of Stan The Man, allow me to cheer for the writing of Dan The Man. Enjoy Daniel’s “Redbird Rants,” including this exclusive chat with Ozzie Smith. Well done, fellow correspondent! I love all the feedback. We can learn so much from each other. How’s your baseball correspondence lately? Please, let me know. 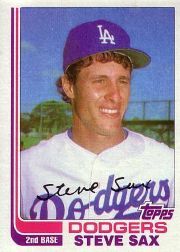 Steve Sax remains a mystery to me. He wasn’t happy signing TTM for free, getting a fan mail handler in 2011 who’d help him charge per signature. Fine. People who’ve written six months ago haven’t had their checks cashed. However, Sax has customers waiting. They are no longer admiring fans and collectors. They’re people purchasing a product (an autograph) from him. Just because the fast-food chain doesn’t take our money, it’s still not cool to be kept in the drive-through line forever. There’s still a large number of current coaches handling their own fan mail, signing for free. I can’t understand why Sax’s job or schedule is so different. there’s going to be a new autograph fee menu issued after baseball season? The prices he agreed to weren’t enough to keep signing interesting, so he’s decided to use the D-backs as an excuse to back out of his deal? I hope not. Please, Mr. All-Star, prove me wrong.